Black Ship Publishing, 9780985196943, 251pp. Kidnapped on the streets of Tangier and sold into slavery, Tariq, Fez, and Aseem are fighting for their lives with the evil warlord, Caid Ali Tamzali, ruler of the Rif Mountains. Joined by British school girl Margaret Owen, also kidnapped and sold to the Caid to join his harem, the four must act quickly to escape before almost certain death--or worse. Although aided by a beautiful assassin and a small but clever band of resistance fighters, their lives depend on their own teamwork, inventiveness, and courage. This fast-paced historical adventure, set in 1912, transports you from Tangier's corrupt slave markets to the wild frontier of the Moroccan desert, to the heart of ancient China, and the pirate-infested seas of the Mediterranean. 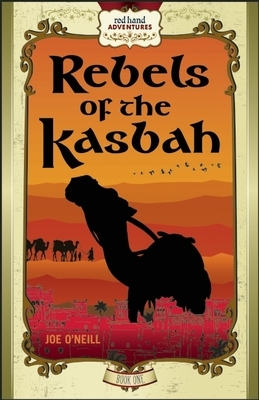 The first book in the Red Hand Adventures series, Rebels of the Kasbah is an exhilarating tale of adventure, daring, danger and friendship. Joe O'Neill: Joe O'Neill is the CEO and founder of Waquis Global Services, which gives him the opportunity of frequent world travel exploring different cultures, where he gathers information and inspiration for his writings.Sara Addicott: Sara Addicott is a freelance editor living and working in Seattle. She is a graduate of Smith College and the University of Washington's editing program and is a member of the Northwest Independent Editors Guild. When she's not working, Sara plays competitive tennis (a lot of it!) and loves traveling, cooking, and watching Seahawks games with her husband and two children.Kristin Myrdahl: Kristin has a background in set design, which enables her to translate visually for the readers, the world Joe O'Neill has created in Red hand Adventures. Also an artist and design consultant, Kristin lives in a hundred year old house over looking the Columbia Gorge in the Pacific Northwest. Anna Fonnier: Anna Fonnier, Director/Owner of Flourish Creative, is a talented graphic designer who enjoys letter press, pottery, raising goats, chickens and riding horses. She lives on an orchard with a glorious view of Mt. Hood.Bedelia C. Walton: Bedelia is a tireless copy editor, making sure all things are accurate for Red hand Adventures. Bedelia lives on a vineyard with her loving husband Leo and their dog, Citra.